Walking is excellent exercise and the Bridgend walks evolved from the success of the Heritage Trails. The walks extend enjoyment of the project and reinstate infrequently-used footpaths. Available to all, our walks take place every Wednesday, with a longer walk on the first and third Saturdays of every month. Ranging from a gentle two mile stroll for those who would benefit from gentle or moderate exercise, (some of whom are referred from the Medical Centre) to ten mile hikes, the walks are graded to suit all abilities. Although daunting joining a new group, people can chat and relax before and after walking. The project promotes opportunities to gain a better understanding and enjoyment of local countryside, learning about heritage in the process. Greater insight helps individuals or groups conserve and enhance the countryside’s natural beauty, and protect its wildlife and cultural heritage. If you do not book on, we cannot guarantee you a place on the bus on the day. You could however drive to the walk start and meet the group there. 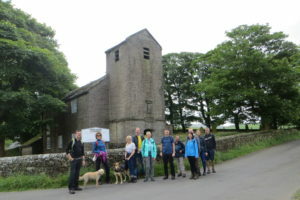 We run a programme of short, easy walks in and around Bollington from April to October every year. The walks are designed to encourage new walkers as well as those looking to get back into the habit of taking some regular exercise. Walking is a great way of feeling happier and healthier and has been described by some as the perfect exercise.